Puglia (Apulia to many English speakers) is a long, thin wine region in the far south-eastern corner of the ‘boot’ of Italy. The Salento Peninsula occupies the southern half of the region, and is of great significance to Puglia’s identity. Not only are there cultural and geographical differences when compared to northern Puglia, but the wines are also different. Where the north is slightly hillier and more connected to the customs and winemaking practices of central Italy, the south is almost entirely flat and retains a strong connection with its Greco-Roman past. The one factor which unites northern and southern Puglia is the choice of crops grown: olives and grapes, in that order. 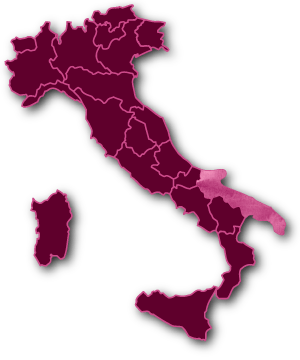 The region is responsible for almost half of Italy’s total olive-oil production and has a long-held reputation as a prolific source of (mostly red) wine. 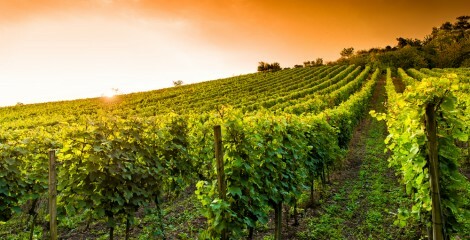 This has had serious economic consequences for Puglia’s vinegrowers and for the reputation of the region’s wines; as the world began to demand higher-quality wines, the mass-produced blending wines in which Puglia specialized lost their value. The Puglian solution was to reduce the woefully loose yield restrictions imposed under its DOC regulations, and to change its approach to winemaking. Fifteen years ago only a tiny percentage of Puglian wine was of DOC quality; that figure is now climbing steadily and new DOCs are being introduced. In 2010 the region even gained its first DOCG in Primitivo di Manduria. Puglia lends itself to division into three rough viticultural areas, although the ‘true’ Puglia is to be found in the south, below the Brindisi–Taranto line, which traces the southernmost stretch of the Appian Way. Here the wines are made from grape varieties almost unique to the area, while in the north the prevalent grapes are those used all over central and northern Italy (such as Sangiovese and Montepulciano). The most obviously full-blooded Puglian grapes are Negroamaro and Primitivo (California’s Zinfandel), while Verdeca is the only salient example among the whites in this hot, red-dominated region. Primitivo is at home in Manduria and Gioia del Colle, and creates robust, powerful wines. Negroamaro is more widespread and defines the red wines of the majority of southern Puglia’s DOCs, including the most renowned: Salice Salentino (both white and red) and Copertino. In terms of terroir, Puglia has a formidable array of natural tools to help encourage prolific vine growth. The hot Mediterranean climate, persistent sunshine and occasional sea breezes make for a near-perfect environment for viticulture. The region’s geology shows a bias towards cretaceous limestone under layers of iron-rich quaternary deposits. Now the area has begun to shake off its reputation for flat, highly alcoholic blending wines, Puglia has an opportunity to seduce the wine world with concentrated, inky reds to rival the best from Australia and South America.